Not to be confused with language change. Proportion of languages used at home by residents aged 6 or over in Taiwan in 2010, sorted by birth year. The chart shorts the tendency that speech communities of Taiwanese local languages are shifting to speak Mandarin. Language shift, also known as language transfer or language replacement or language assimilation, is the process whereby a speech community of a language shifts to speaking another language. Often, languages that are perceived to be higher status stabilise or spread at the expense of other languages that are perceived by their own speakers to be lower-status. For prehistory, Forster et al. (2004) and Forster and Renfrew (2011) observe that there is a correlation of language shift with intrusive male Y chromosomes but not necessarily with intrusive female mtDNA. They conclude that technological innovation (the transition from hunting-gathering to agriculture, or from stone to metal tools) or military prowess (as in the abduction of British women by Vikings to Iceland) causes immigration of at least some males, who are perceived to be of higher status than local males. Then, in mixed-language marriages with these males, prehistoric women prefer to transmit the "higher-status" spouse's language to their children, yielding the language/Y-chromosome correlation seen today. The process whereby a community of speakers of one language becomes bilingual in another language, and gradually shifts allegiance to the second language is called assimilation. When a linguistic community ceases to use their original language, language death is said to occur. The rate of assimilation is the percentage of individuals with a given mother tongue who speak another language more often in the home. The data are used to measure the use of a given language in the lifetime of a person, or most often across generations within a linguistic community. In the context of the Indo-European migrations, it has been noted that small groups can change a larger cultural area. Michael Witzel refers to Ehret’s model[note 1] "which stresses the osmosis, or a "billiard ball," or Mallory’s Kulturkugel, effect of cultural transmission." According to Ehret, ethnicity and language can shift with relative ease in small societies, due to the cultural, economic and military choices made by the local population in question. The group bringing new traits may initially be small, contributing features that can be fewer in number than those of the already local culture. The emerging combined group may then initiate a recurrent, expansionist process of ethnic and language shift. Language shift can be understood best as a social strategy through which individuals and groups compete for positions of prestige, power, and domestic security [...] What is important, then, is not just dominance, but vertical social mobility and a linkage between language and access to positions of prestige and power [...] A relatively small immigrant elite population can encourage widespread language shift among numerically dominant indigenes in a non-state or pre-state context if the elite employs a specific combination of encouragements and punishments. Ethnohistorical cases [...] demonstrate that small elite groups have successfully imposed their languages in non-state situations. Historical examples for status shift are the early Welsh and Lutheran Bible translations, leading to the liturgical languages Welsh and Standard German thriving today. Until the mid 19th century, southern Carinthia in Austria had an overwhelming Slovene-speaking majority: in the 1820s, around 97% of the inhabitants south of the line Villach-Klagenfurt-Diex spoke Slovene as their native language. In the course of the 19th century, this number dropped significantly. By 1920, already a third of the population of the area had shifted to German as their main language of communication. After the Carinthian Plebiscite in the 1920s, and especially after World War II, most of the population shifted from Slovene to German. In the same region, today only some 13% of the people still speaks Slovene, while more than 85% of the population speaks German. The figures for the whole region are equally telling: in 1818, around 35% of the population of Carinthia spoke Slovene; by 1910, this number dropped to 15.6% and by 2001 to 2.3%. These changes were almost entirely the result of a language shift in the population, with emigration and genocide (by the Nazis during the Second World War) playing only a minor role. Despite the withdrawal of Belarus from the USSR proclaimed in 1991, use of the Belarusian language is declining. According to a study done by the Belarusian government in 2009, 72% of Belarusians speak Russian at home, and Belarusian is used by only 11.9% of Belarusians. 52.5% of Belarusians can speak and read Belarusian. Only 29.4% can speak, read and write it. According to the research, one out of ten Belarusians does not understand Belarusian. In the last two centuries, Brussels transformed from an exclusively Dutch-speaking city to a bilingual city with French as the majority language and lingua franca. The language shift began in the 18th century and accelerated as Belgium became independent and Brussels expanded out past its original city boundaries. From 1880 on, more and more Dutch-speaking people became bilingual, resulting in a rise of monolingual French-speakers after 1910. Halfway through the 20th century, the number of monolingual French-speakers carried the day over the (mostly) bilingual Flemish inhabitants. Only since the 1960s, after the establishment of the Belgian language border and the socio-economic development of Flanders was in full effect, could Dutch stem the tide of increasing French use. French remains the city's predominant language and Dutch is spoken by a minority. Historically, an important language shift in China has been the near disappearance of the Manchu language. When China was ruled by the Qing dynasty, whose Emperors were Manchu, Chinese and Manchu had co-official status, and the Emperor heavily subsidized and promoted education in Manchu, but the fact that most of the Manchu Eight Banners lived in garrisons with Mandarin speaking Han Bannermen located across Han Chinese civilian populated cities meant that most Manchus spoke the Beijing dialect of Mandarin by the 19th century and the only Manchu speakers were garrisons left in their homeland of Heilongjiang. Today there are fewer than 100 native speakers of Manchu. At the current time language shift is occurring all across China. Many languages of minority ethnic groups are declining, as well as the many regional varieties of Chinese. Generally the shift is in favour of Standard Chinese (Mandarin)- but in the province of Guangdong the cultural influence of nearby Hong Kong's has meant local dialects and languages are being abandoned for Cantonese instead and in cities such as Zhongshan, Shunde, Nanhai District, Panyu and Dongguan, younger native residents mostly communicate in Cantonese, instead of their mother-tongue. In Egypt, the Coptic language, a descendant of the Afro-Asiatic Egyptian language, was in decline in usage since the time of the Arab conquest in the 7th century. By the 17th century, it was eventually supplanted as a spoken language by Egyptian Arabic. Coptic is today mainly used by the Coptic Church as a liturgical language. In Ethiopia, various populations of Nilotic origin have shifted languages over the centuries, adopting the idioms of their Afro-Asiatic-speaking neighbors in the northern areas. Among these groups are the Daasanach or Marille, who today speak the Daasanach language. It belongs to the Cushitic branch of the Afro-Asiatic family. However, modern genetic analysis of the Daasanach indicates that they are more closely related to Nilo-Saharan and Niger-Congo-speaking populations inhabiting Tanzania than they are to the Cushitic and Semitic Afro-Asiatic-speaking populations of Ethiopia. This suggests that the Daasanach were originally Nilo-Saharan speakers, sharing common origins with the Pokot. In the 19th century, the Nilotic ancestors of these two populations are believed to have begun separate migrations, with one group heading southwards into the African Great Lakes region and the other group settling in southern Ethiopia. There, the early Daasanach Nilotes would have come into contact with a Cushitic-speaking population, and eventually adopted this group's Afro-Asiatic language. Finland still has coastal Swedish-speaking enclaves, unlike Estonia where the last coast-Swedes were decimated or escaped to Sweden in 1944. As Finland was under Swedish rule from the medieval ages until 1809, the language of education was Swedish, with Finnish being allowed as a medium of education at the university only in the 19th century, and the first thesis in Finnish being published in 1858. Several of the coastal cities were multilingual; Viipuri had newspapers in Swedish, Finnish, Russian and German. However, the industrialization in the prewar and especially the postwar era and the "escape from the countryside" of the 1960s changed the demography of the major cities and led to the Finnish language dominating. While Helsinki was a predominantly Swedish-speaking city in 1910, the Swedish-speaking minority is now 6% of the population. In Alsace, France, a longtime Alsatian-speaking region, the native Germanic dialect has been declining after a period of being banned at school by the French government after the First World War and the Second World War. It is being replaced by French. Flemish (green) and French (red/brown) as spoken in the arrondissement of Dunkirk in 1874 and 1972. French Flanders, which gradually became part of France between 1659 and 1678, was historically part of the Dutch sprachraum, the native dialect being West Flemish (French Flemish). This is corroborated by the Dutch origin of several town names in the region, such as that of 'Dunkerque' (Dunkirk) which is a French phonetic rendition of the original Dutch name 'Duinkerke' (meaning 'church in the dunes'). The linguistic situation did not change dramatically until the French Revolution in 1789, and Dutch continued to fulfill the main functions of a cultural language throughout the 18th century. During the 19th century, especially in the second half of it, Dutch was banned from all levels of education and lost most of its functions as a cultural language. The larger cities had become predominantly French-speaking by the end of the 19th century. However, in the countryside, many elementary schools continued to teach in Dutch until World War I, and the Roman Catholic Church continued to preach and teach the catechism in Flemish in many parishes. Nonetheless, since French enjoyed a much higher status than Dutch, from about the interbellum onward, everybody became bilingual, the generation born after World War II being raised exclusively in French. In the countryside, the passing on of Flemish stopped during the 1930s or 1940s. Consequently, the vast majority of those still having an active command of Flemish are older than 60. Therefore, complete extinction of French Flemish can be expected in the coming decades. The French Basque Country has been subject to intense French-language pressure exerted over the Basque-speaking communities. Basque was both persecuted and excluded from administration and official public use during the takeover of the National Convention (1792-1795), War of the Pyrenees and the Napoleonic period. The compulsory national education system imposed early on a French-only approach (mid-19th century), marginalizing Basque, and by the 1960s family transmission was grinding to a halt in many areas at the feet of the Pyrenees. By the 2010s, the receding trend has been somewhat mitigated by the establishment of Basque schooling (the ikastolak) spearheaded by the network Seaska, as well as the influence of the Basque territories from Spain. According to Fañch Broudic, Breton has lost 80% of its speakers in 60 years. 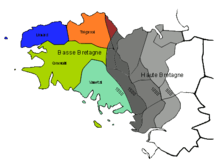 Other sources mention that 70% of Breton speakers are over 60. Furthermore, 60% of children received Breton from their parents in the 20s and only 6% in the 80s. Since the 1980s, monolingual speakers are no longer attested. On the 27 October 2015, the Senate rejected the draft law on ratification of the European Charter for Regional or Minority Languages driving away the assumption of Congress for the adoption of the constitutional reform which would have given the value and legitimacy to regional languages such as Breton. Corsican was long the vernacular language alongside Italian, the official language in Corsica until 1859; afterwards Italian was replaced by French, owing to the acquisition of the island by France from Genoa in 1768. Over the next two centuries, the use of French grew to the extent that, by the Liberation in 1945, all islanders had a working knowledge of French. The 20th century saw a wholesale language shift, with islanders changing their language practices to the extent that there were no monolingual Corsican speakers left by the 1960s. By 1995, an estimated 65 percent of islanders had some degree of proficiency in Corsican, and a small minority, perhaps 10 percent, used Corsican as a first language. In Hong Kong, Cantonese had been a dominant language, largely spoken in the society, since the immigration to Hong Kong starting from the 1940s. With Immigrants of different Mother-tongue, communication was hard without a dominant language. With Cantonese originating from the Capital of the Province, Canton, Cantonese had been the dominant language, and other similar dialects started to vanish from Hong Kong. Original Residents (or Aboriginals) of Hong Kong also had their own languages including the Tanka, Hakka and Waitau dialect. But with a majority of Hong Kong's population being immigrants by the 1940s and 50s, the dialects vanished at a rapid rate. Cantonese eventually dominated Hong Kong. Most of Hong Kong's younger generation does not speak or even understand their ancestral dialects. Starting from the 1990s, since Hong Kong returned to Chinese sovereignty, Mandarin Chinese has been more widely used in Education and many other areas. The adoption of Mandarin Chinese into the society has been fast, even though Hong Kong Residents would not regard it as a first language. Most Hong Kong Residents do speak Mandarin but communicate with Cantonese generally. Cumans seeking refuge from the Turko-Mongols settled in Hungary and were later Magyarized. The Jassic people of Hungary originally spoke the Jassic dialect of Ossetic, but have completely adopted the Hungarian language, forgetting their previous Ossetian language. The territory of today's Hungary was also previously settled by Slavic tribes, which became gradually assimilated to the Hungarian language. Also, language shift may have happened during Hungarian pre-history, as the prehistoric culture of Magyars shows very little similarity to the other Uralic peoples. The Italian peninsula and the Po's basin have been a conglomerate of different languages, Latin-derived for the most part. Italy was politically divided up to the late 19th century. Since the Renaissance, a standard for formal, literary and written purposes was developed based on the Tuscan variety. It developed as the language of unified Italy, providing the basis for the Italian language and sidelining other languages of Italy in education and formal settings. These vernaculars have been incorrectly labelled as 'dialects'. Italian expanded as a common linguistic form for everyday use after World War II. The Cimbrian a Germanic language related to Bavarian, was spoken by at least 20,000 people in the 19th Century, with 3,762 people in 1921 and fewer than 300 in 2007. The same scenario goes for Mòcheno. Under Fascism non-Italian languages were banned, and surnames were changed to sound more Italian. The emphasis on monolingual (Italian-only) policies and assimilation has continued after World War II, with historical sites and ordinary objects renamed in Italian. The Ministry of Public Education reportedly requested the monitoring of Sardinian teachers. The language has been stigmatized as indicative of a lack of education, and as a result it is associated still by many locals with shame, backwardness and provincialism. Despite campaigns to give Sardinian equal status with Italian as a means to promote cultural identity, a number of factors like immigration from mainland Italy, the interior rural exodus to urban areas and the use of Italian as a prerequisite for jobs and social advancement actually hinder any policy set up to promote the language. For example, despite bilingual-education laws, the use of Sardinian in schools is still discouraged. Therefore, UNESCO classifies Sardinian as "definitely endangered", because "many children learn the language, but some of them cease to use it throughout the school years". At present, language use is far from stable: reports show that, while an estimated 68 percent of the islanders have a good oral command of Sardinian, language ability among the children drops to around 13 percent; some linguists cite the low number of Sardinian-speaking children as indicative of language decline. Instead, most of the younger generation, although they do understand some Sardinian, is actually monolingual and speaks a mixture of Italian and Sardinian (considered regional Italian by linguists) that is called italiànu porcheddìnu ("piggy Italian", meaning more or less "broken Italian") by native Sardinian speakers. Today, people who speak Sardinian on an everyday basis mainly live in the sparsely populated interior of the island, like the Barbagia region. At the present day, the Sardinian-speaking community, despite being the largest minority language group recognised by Italy, is also the least protected one and the language is receding in all domains of use. A solution to the Sardinian question is unlikely to be found any time soon. On a survey made by Il Gazzettino, 70% of respondents told they spoke Venetian very or quite often in the family, while 68% with friends. Much smaller share than there used to at work (35%). Compared to 2001, it is the latter sector where the dialect is more in crisis. In fact, if for use within the family networks and friendship, negative signs stop respectively at -4 and -11 percentage points, in the workplace, the balance drops to -22 percentage points. It has to be noted that young people under the age of 25 and students are in the social sectors where the use of dialect falls below the threshold of absolute majority (respectively 43 and 41%), showing a visible generational separation. The use of the French language in Canada is complex. In English-speaking regions of Canada, many former Canadian French language minorities have disappeared. Meanwhile, in Quebec, the decline of French has been reversed, and given high rates of emigration and substantial intermarriage with French Canadians, the English language has declined. Quebec's Eastern Townships, once a predominantly English-speaking region, is now overwhelmingly French-speaking. The French-speaking populations of neighboring Ontario and New Brunswick, once on the decline, have also rebounded. Before the 1930s, Italian was the only official language of Malta, even though it was spoken by only the upper classes, with Maltese being spoken by the lower class. However, English was then added to the mix, and was made a co-official language alongside Maltese, with Italian being dropped as official. The English language has since grown in the country and now threatens the status of Maltese. The number of speakers of Italian there has increased from when the language was official. A trend among the younger generations is to mix English and Italian vocabulary patterns, in making new Maltese words. For example, the Maltese word for library was originally "bibljoteka", but this has since been displaced by "librerija", formed from the English "library", and an Italian pattern ending. In addition to mixing English with Italian, Maltenglish is a commonly occurring amalgam of English and Maltese. This involves using English words in Maltese sentences, or adding English vocabulary into Maltese. Trends show that English is not only becoming the language of choice for more and more people, but is actually transforming the Maltese language itself. In the Philippines, Spanish-speaking families have gradually switched over to English since the end of World War II until the former eventually ceased to be a practical everyday language in the country. Another example would be the gradual death of the Kinaray-a language of Panay as many native speakers especially in the province of Iloilo are switching to Hiligaynon or mixing the two languages together. Kinaray-a was once spoken in the towns outside the vicinity of Iloílo City, while Hiligaynon was limited to only the eastern coasts and the city proper. However, due to media and other factors such as urbanization, many younger speakers have switched from Kinaray-a to Hiligaynon, especially in the towns of Cabatuan, Santa Barbara, Calinog, Miagao, Passi City, Guimbal, Tigbauan, Tubungan, etc. Many towns, especially Janiuay, Lambunao, and San Joaquin still have a sizeable Kinaray-a-speaking population, with the standard accent being similar to that spoken in the predominantly Karay-a province of Antique. Even in the province of Antique, "Hiligaynization" is an issue to be confronted as the province, especially the capital town of San José de Buenavista, undergoes urbanisation. Many investors from Iloílo City bring with them Hiligaynon-speaking workers who are reluctant to learn the local language. One of the problems of Kinaray-a is its written form, as its unique "schwa sound" is difficult to represent in orthography. As time goes by, Kinaray-a has disappeared in many areas it was once spoken especially in the island of Mindoro and only remnants of the past remain in such towns as Pinamalayan, Bansud, Gloria, Bongabong, Roxas, Mansalay, and Bulalacao in Oriental Mindoro and Sablayan, Calintaan, San Jose, and Magsaysay in Occidental Mindoro, as Tagalog has become the standard and dominantly recognised official language of these areas. After Singapore's independence in 1965, there was a general language shift in the country's interracial lingua franca from Malay to English, as English was chosen as the first language for the country. Among the Chinese community in Singapore, there was a language shift from the various dialects of Chinese to Mandarin Chinese. For instance, Mandarin Chinese has replaced Singaporean Hokkien as the lingua franca of Chinese community in Singapore today. There has been a general language attrition in the use of Chinese other than Mandarin Chinese, especially amongst young Singaporean populace. The progressive dominion exerted by the Kingdom of Castile over Spain in as much as it gained political power throughout centuries, contributed to the expansion of its language at the expenses of the rest. The accession of the Castilian House of Trastamara to the Crown of Aragon by mid-15th century saw the displacement of the royal language of Aragon up to that point, Aragonese. Nebrija's Gramatica castellana (1492), sponsored by the new Spanish monarch Ferdinand II of Aragon, was meant to help expand Castilian, "the companion of the Empire". As the Crown of Castile expanded, its different governmental officials at different levels required their subjects to use or understand Castilian and sideline other vulgar languages, or vernaculars. It often meant the use of interpreters in lawsuits, which could tilt the outcome of the case one side or the other, e.g. the Basque witch trials, and the increased use of Castilian in assemblies and decision-making bodies, and documents, despite not being the commonly understood language in a number of areas, like most of the Basque districts (Navarre, Álava, etc. ), Catalonia, Galicia, Asturias, parts of Aragon, etc. As Aragonese retreated to the sub-Pyrenean valleys, Arabic vanished by the early 17th century, when forced cultural assimilation of the Moriscos was coupled with expulsion (completed in 1614). The arrival of the Bourbons (1700) intensified the centralization of governmental structures and the imposition of Castilian as the only language for official purposes, replacing in 1716 Catalan as the language of Justice Administration in the relevant territories (Nueva Planta Decrees). Unlike Catalan, Basque was never a language written on official documents, but was equally affected. It lost ground to Castilian in all its buffer geographic areas, as well as main institutions as a communication language, after a number of decrees and orders established Castilian as "the national language of the Empire" during Charles III's reign; printing in languages other than Spanish was forbidden (1766), and Castilian was the only language taught in school (1768). The Peninsular War was followed by the centralization of Spain (Constitutions of 1812, 1837, 1845, 1856, etc. ), with only the Basque districts keeping a separate status until 1876. Compulsory education in 1856 made it mandatory the use of Castilian (Spanish), as well as discouraging and forbidding the use of other languages on a number social and institutional settings. Franco and his nationalist dictatorship imposed Spanish as the only valid language for any formal social interaction (1937). By the early 21st century, Spanish was the overwhelmingly dominant language in Spain, with Basque, Catalan, and Galician surviving and developing in their respective regions with different levels of recognition since 1980. Other minorized languages (Asturian, Aragonese) have also seen some recognition in the early 21st century. Catalan, sharing with Basque a strong link between language and identity, enjoys a fairly sound status. Basque competence levels have picked up during the last decades, but everyday use does not go up accordingly. Asturian has been classified by the Endangered Languages Project as being at risk, and Aragonese as an endangered language. The most commonly used home language in Taiwan, Penghu, Kinmen and Matsu, 2010. Taiwanese Mandarin are marked with blue. Taiwanese aborigines had used only Austronesian languages before other ethnic groups conquered Taiwan. After migration of lots of Han people from the 17th to the 19th century, many Taiwanese Plains Aborigines were Sinicized, and shifted their languages to other Sinitic (mainly Taiwanese Hokkien). Besides, some Hakka people (especially in Yongjing, Changhua, Xiluo, Yunlin, etc.) also shifted their use of Hakka Chinese to Hokkien (also called Hoklo). They are named Hoklo-Hakka (Pha̍k-fa-sṳ: Ho̍k-ló-hak, Pe̍h-oē-jī: Ho̍k-ló-kheh, Hanzi: 福佬客). When Taiwan was under Japanese rule, Japanese became the official language in Taiwan, and the Japanese government promoted the language education of Japanese. It also led to the creation of Yilan Creole Japanese, a mixture of Japanese, Atayal language, Hokkien etc. in Yilan County. In World War II, under the Japanification Movement, Chinese was banned in newspapers and school lectures, and the usage of Japanese at home was encouraged, so many urban people used Japanese. 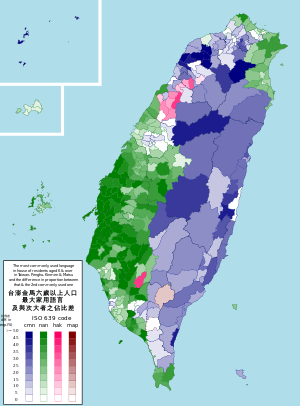 In 1941, 57% of Taiwanese could speak Japanese. After the ROC government started ruling Taiwan in 1945, it prohibited the usage of Japanese in newspapers, school in 2 years, and continued promoting the Guoyu movement (Chinese: 國語運動) to popularise Standard Mandarin, even by means of coercion. In the primary education system, people using local languages would be fined or forced to put on a dialect card. In the mass media, local languages were also discouraged or prohibited, and some books or the romanization of local languages (e.g. Bibles, lyrics books, Pe̍h-oē-jī) were banned. In 1975, The Radio and Television Act (Chinese: 廣播電視法) was adopted, restricting the usage of local languages on the radio or TV. In 1985, after the draft of the Language and Script Law (Chinese: 語文法) was released by the Ministry of Education, it received a lot of opposition because it banned the use of Taiwanese unofficial languages in the public domain. Then some Hakka groups demonstrated to save their language. After 1987 when the martial law was lifted, the Guoyu movement ceased. The shift towards monolingual Mandarin was more pronounced amongst the Hakka speaking communities, attributed to the low social prestige of Hakka. Prior to the takeover of the island from the Japanese empire, the Hakka were expected to learn both Hokkein and Japanese. However, the lack of a significant Japanese speaking base in which to gain and then retain fluency meant that most Hakka instead learned only Hokkein. When the KMT fled to Taiwan, most mainlanders settled mainly in northern Taiwan, close to the Hakka speaking areas, so spurring a linguistic shift from Hokkein to Mandarin within the Taipei area. As the bulk of the economic activity became centered around patronage networks revolving around KMT membership which were Mandarin speaking, most of the Hakka turned into Mandarin monolinguals, due to a shift in social mobility previously centered around Hokkein. Elsewhere, although the percentage of Hokkein speaking population declined in relation to its share of the population, most Hokkein speaking households have been able to retain fluency in Hokkein, helped by the liberalization of Taiwanese politics and the end of KMT martial law. Nevertheless, Taiwanese Mandarin has become the most common language in Taiwan today, and the biggest home language of Taiwanese youths is Mandarin, The ability of Taiwanese to speak ethnic languages is declining strikingly. In the population census of 2010, Mandarin is the most commonly home language in the Taipei metropolitan area, Taoyuan, Matsu, the aboriginal areas, some Hakka areas, as well as some urban areas in Taichung and Kaohsiung. Cockney English, traditionally spoken by working-class Londoners has been predicted to be replaced by Multicultural London English (MLE) or 'Jafaican' within 30 years as Cockneys move out of London. The new language is theorised to have emerged as new migrants spoke their own forms of English such as Nigerian and Indian and contains elements from "learners’ varieties" as migrants learn English as a second language. Although English has been the majority language in the United States since independence in 1776, other languages were spoken first in large areas of the country. In addition to hundreds of aboriginal languages, French was once the primary language in Louisiana, Missouri, and areas along the border with Quebec, but the speaking has diminished due to new waves of migration and the rise of English as a lingua franca. Californio Spanish rapidly became a minority language during the mass immigration that took place during the California Gold Rush, and has largely been supplanted by English and Mexican Spanish, surviving mainly as a prestige dialect in Northern and Central California. German was once the primary language in large areas of the Great Plains, but was suppressed due to anti-German sentiment during the First World War. Since the fall of Saigon at the end of the Vietnam War in 1975, French has declined heavily in Vietnam from being a government language and primary language of education in South Vietnam to being a minority language limited to the elite classes and elderly population. Today, French is spoken fluently by only slightly over 5% of the Vietnamese population. The language shift from French to Vietnamese occurred earlier in the north due to Viet Minh and later communist policies enforcing Vietnamese as the sole language for political and educational purposes. However, since the late 1990s, there has been a minor revival of French in Vietnam. American linguist Joshua Fishman has proposed a method of reversing language shift which involves assessing the degree to which a particular language is disrupted in order to determine the most effective way of assisting and revitalising the language. ↑ Michael Witzel: Ehret, Ch., 1988. "Language Change and the Material Correlates of Language and Ethnic Shift," Antiquity, 62: 564–74; derived from Africa, cf. Diakonoff 1985. ↑ Compare the process of Sanskritization in India. ↑ Another example Anthony gives of how an open social system can encourage recruitment and language shift, are the Pathans in estern Afghanistan. Traditionally status depended on agricultural surpluses and landownership. The neighbouring Baluch, outnumbered by the Pathans, were pastoral herders, and has hierarchical political system. Pathans who lost their land, could take refuge among the Baluch. As Anthony notes, "chronic tribal warfare might generally favor pastoralism over sedentary economics as herds can be defended by moving them, whereas agricultural fields are an immobile target." ↑ Sources: 2010 polulation and housing census by DGBAS, Executive Yuan. ↑ Jones, Martin (2004). Traces of Ancestry. Cambridge. ↑ Forster P, Renfrew C (2011). "Mother tongue and Y chromosomes". Science. 333 (6048): 1390–1391. doi:10.1126/science.1205331. PMID 21903800. 1 2 3 4 Witzel 2005, p. 347. ↑ Anthony 2007, p. 117-118. 1 2 Anthony 2007, p. 118. ↑ Anthony 2007, p. 118-119. ↑ Barker, Christopher (1588). The Bible in Welsh. London. ↑ Thomas M. Barker, The Slovene Minority of Carinthia (New York: Columbia University Press, 1984). ↑ Matjaž Klemenčič and Vladimir Klemenčič, The Endeavors of Carinthian Slovenes for their Ethnic Survival with/against Austrian Governments after World War II (Klagenfurt-Ljubljana-Vienna: Mohorjeva založba/Hermagoras Verlag, 2008). ↑ "Université Laval: Accueil". ulaval.ca. ↑ "Thuis in gescheiden werelden — De migratoire en sociale aspecten van verfransing te Brussel in het midden van de 19e eeuw - BTNG-RBHC, XXI, 1990, 3-4, pp. 383-412, Machteld de Metsenaere, Eerst aanwezend assistent en docent Vrije Universiteit Brussel" (PDF). biobrussel.be (in Dutch). ↑ J. Fleerackers, Chief of staff of the Belgian Minister for Dutch culture and Flemish affairs (1973). "De historische kracht van de Vlaamse beweging in België: de doelstellingen van gister, de verwezenlijkingen vandaag en de culturele aspiraties voor morgen". Digitale bibliotheek voor Nederlandse Letteren (in Dutch). ↑ "Protesters Stand Firm on Cantonese Rights". TIME. 2 August 2010. Retrieved 3 April 2012. ↑ Veltman & Denis (1989) Le declin du dialecte alsacien. 1 2 3 4 "Dutch/Flemish in the north of France" (PDF). , by Hugo Ryckeboer. University of Ghent. ↑ Raynaudon-Kerzerho, Maiwenn. "Fañch Broudic : "Le breton a perdu 80 % de locuteurs en 60 ans."". Retrieved 1 November 2015. ↑ Hutchinson, Wesley; Ní Ríordáin, Clíona (2010). Language issues: Ireland, France and Spain. Peter Lang. p. 176. ↑ "Le Sénat dit non à la Charte européenne des langues régionales". franceinfo. Retrieved 1 November 2015. ↑ "Corsican in France". Euromosaic. Retrieved 2008-06-13. To access the data, click on List by languages, Corsican, Corsican in France, then scroll to Geographical and language background. ↑ Coluzzi, Paolo (2007). Minority Language Planning and Micronationalism in Italy. Peter Lang. p. 224. ↑ Lussu became Lusso, and Pilu changed to Pilo; a large number of Sardinian surnames were affected by this policy. ↑ Lingua sarda: dall’interramento alla resurrezione? ↑ "Sardinian language use survey". Euromosaic. To access the data, click on List by languages, Sardinian, then scroll to "Sardinian language use survey". ↑ "The internet as a Rescue Tool of Endangered Languages: Sardinian – Free University of Berlin" (PDF). ↑ Salminen, Tapani (1993–1999). "UNESCO Red Book on Endangered Languages: Europe:". Retrieved 2008-06-13. ↑ Marongiu, Maria Antonietta (2007). Language Maintenance and Shift in Sardinia. ProQuest. p. 149. ↑ Damien Simonis (2003). Sardinia. Lonely Planet Publications. pp. 240–241. ISBN 9781740590334. ↑ Porcellato, Natascia. "A Nordest il dialetto resiste ma si parla più in famiglia che al lavoro". Retrieved 1 November 2015. 1 2 Ang Ui-jin. "台灣的語言政策何去何從". ↑ Yardumian, Aram; Schurr, Theodore G. (2011). "Who Are the Anatolian Turks?". Anthropology & Archeology of Eurasia. 50: 6–42. doi:10.2753/AAE1061-1959500101. Retrieved 21 October 2013. These data further solidify our case for a paternal G/J substratum in Anatolian populations, and for continuity between the Paleolithic/Neolithic and the current populations of Anatolia. ↑ Rosser, Z.; Zerjal, T.; Hurles, M.; Adojaan, M.; Alavantic, D.; Amorim, A.; Amos, W.; Armenteros, M.; Arroyo, E.; Barbujani, G.; Beckman, G.; Beckman, L.; Bertranpetit, J.; Bosch, E.; Bradley, D. G.; Brede, G.; Cooper, G.; Côrte-Real, H. B.; De Knijff, P.; Decorte, R.; Dubrova, Y. E.; Evgrafov, O.; Gilissen, A.; Glisic, S.; Gölge, M.; Hill, E. W.; Jeziorowska, A.; Kalaydjieva, L.; Kayser, M.; Kivisild, T. (2000). "Y-Chromosomal Diversity in Europe is Clinal and Influenced Primarily by Geography, Rather than by Language". The American Journal of Human Genetics. 67 (6): 1526–1543. doi:10.1086/316890. PMC 1287948 . PMID 11078479. ↑ "'Jafaican' is wiping out inner-city English accents". Mail Online. Retrieved 2016-11-07. ↑ "BBC show reveals cockneys are 'endangered species' in London borough". Mail Online. Retrieved 2016-11-07. ↑ "Cockney to disappear from London 'within 30 years'". BBC News. 2010-07-01. Retrieved 2016-11-07. ↑ "Research shows that Cockney will disappear from London's streets within a generation". Lancaster University News. Retrieved 2016-11-07. Bastardas-Boada, Albert (2007), "Linguistic sustainability for a multilingual humanity", Glossa. An Interdisciplinary Journal (on-line), vol. 2, n. 2. Ohiri-Aniche, C (1997). "Nigerian languages die". Quarterly Review of Politics, Economics and Society. 1 (2): 73–9.